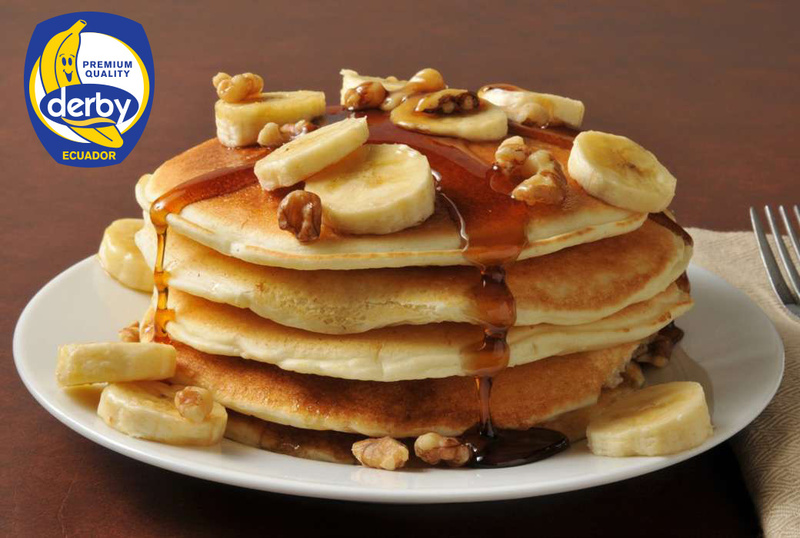 Banana pancakes | DERBY® PREMIUM BANANAS RASTODER Company - DERBY bananas and other fresh FRUIT and VEGETABLED for you! If you know how to make classic pancakes, you will be impressed by banana pancakes. For these pancakes you only need two ingredients: banana and eggs! Knead the larger banana with a fork into a single mass (it is good to have some lumps), add two eggs, mix with fork and a mixture of pancakes is ready! It is recommended that you do not use the mixer because it destroys the composi-tion of the mixture, and those who pepper the pancakes are recommended to add a spoonful of flour to connect the ingredients of the dough the next time. Bananas should occupy a third of the pan to produce mini pancakes. Bake pan-cakes on butter, for 30 seconds on both sides. Stack them to one another, creating a smaller tower. Beat them with butter while they are still hot, pour them with honey or chocolate dressing and decorate with berries or some other fruit. Opomba: navedeni odmerek je za eno osebo, spečete lahko od štiri do šest palačink.